Despite living side by side for hundreds of years, science and religion can still seem to be at odds in the world today. The former provides testable hypotheses on the nature of reality, while the latter continues to draw faithful millions to divine possibilities for mankind. 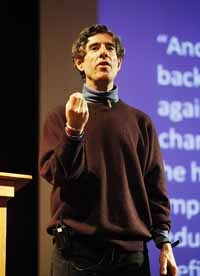 Neuroscientist Dr. Richard Davidson blurred the boundaries between those two perspectives during a lecture at the Community School auditorium in Sun Valley on Thursday, March 17. Hundreds of people attended the free community event and some had to be turned away because of lack of seats. Davidson has used brain-scan technology to study changes in electrical activity in Buddhist monks and lay practitioners for years in an effort to measure the effects of meditation, a staple practice in contemplative spiritual traditions. His findings indicate that the brain is more malleable than previously believed. He said that even 30-minute meditation sessions for two weeks improve the regulation of emotions and resistance to some diseases. Davidson also said meditation on compassion for ourselves and others can provide improved mental focus and goodwill in American society, which he said was in the throes of an "attention-deficit-disorder epidemic." Davidson said he developed many of his ideas and studies in collaboration with the Dalai Lama of Tibet and other monks, bringing the spiritual discipline of meditation together with the scientific discipline of neuroscience, but said that hasn't led him to any definitive definition of the mind. "Scientists say the mind is a function of the brain and body only," he said. "But if you hang around with the people I hang around with, you begin to wonder." Davidson said the Dalai Lama had presented compelling ideas to him indicating that there are features of what we call the mind that have nothing to do with the human body at all. "This is absolute heresy in the scientific community," he said. "I prefer to stay agnostic on this, because there are no good arguments on either side." Davidson said he envisioned a time in the future when societies are geared toward achieving the positive benefits of meditation, especially in children. He said that could engender benefits in the fields of education, environmental conservation and prison systems. "But there is no substitute for practice," he said.